What is your level of skill? If you are looking for ocean fishing Kayaks, I bet you are an adventurous person; you want to fish in open water environment with wind and waves, challenge your fishing skill with some big and stubborn ocean fishes. These fishes, to catch, you will need an appropriate boat. Fishing Kayaks have recently become a popular type of boat among people who love fishing because of their portability, durable and of course, affordable. Result from their popularity, the Kayaks industry exploded with too many of the products in the market. This is where you find yourself lost. I am here to help you choose the best ocean fishing Kayak for your own. What to consider when choosing ocean fishing Kayaks? This depends on countless features but in this post I will only mention 6 key factors that significantly affect your decision. Check it out. You are an amateur? Experienced? Or you are already a professional angler in Kayak fishing? This is common sense for you to ask yourself this question. If you are a beginner, it is wasteful to buy a fishing kayak with too many features that you would never use. If you are experienced or pro, it going to be unwise to buy the one with just a few features because you will need more than just a chair and a rod. Ocean fishes are really fast. So you need a Kayak with appropriate speed to chase them down. The length of the Kayak decides its speed. The longer the Kayak is, the faster it is. The 11 feet Kayak is much slower than the 12 feet Kayak. Your body size also affects the length the Kayak should be. If you are tall and heavy, your Kayak shouldn’t be too short because it will make your already slow Kayak become slower, not to mention it may sink. As you fish in the ocean, an unstable environment, Kayaks with high stability will keep you safe. If you are experienced or pro anglers, you have the skill to balance the boat by yourself. Instead of high stability Kayaks, I recommend you to challenge yourself with low stability ones. But if you are a beginner with Kayaks fishing, you should look for Kayaks with good stability for 2 reasons: You don’t know how to stabilize your boat and more you can’t perform re-entry recovery fluently if your Kayak accidentally flips. Moreover, ocean fishes are heavy and strong so they can easily flip your boat. What decides the stability of a Kayak? The answer is the width and shape of its. The wider the Kayak is, the more stable it is. There are 3 basic shapes of Kayaks hull. Flat hulls are very stable but very slow. V-shaped hulls are fast but less stable. Rounded hulls balance between stability and speed. You are going to go offshore fishing; it’s clearly difficult for you to get back to land to buy a bottle of water or a hamburger or bait if you run out of any of those things. So capacity is important to determine if your Kayak is the best ocean fishing Kayak. There are many Kayaks on the market come with different capacity. There are some kayaks have a very big hatch; some only have a small one. A few have 3 hatches, some have only 1. Some with hatches easy to reach, with some we have to struggle. With a lot of choices, you should choose the most suitable for yourself. Are you a gear guy? How many foods do you need? How much water will be enough? Do you need any room for electronics? These basic questions will lead you to your decision. While pedal you use your legs to power Kayak, with the paddle you power Kayak with your arms. Examine these pros& cons will help you make up your mind. The idea to use your legs to move your Kayak obviously means your hands are free to hold your rod when you fish or when you want to chase the fish down without putting your hands off the rod. At this point, the pedal has an advantage. However, if you just want to catch some small fish and enjoy the traditional way to move a boat. Then paddle is a good idea. People use paddles to move their boat since boat invented. This is a way to exercise your arms, enjoy the view, and catch some easy fish if you like. With the paddle, your Kayak will have less space than with only a convenient pedal. As I said above, space is important when you are on the ocean. Materials used to make Kayaks are various from plastic to composite materials. Let’s see what difference it makes. Composite materials such as fiberglass, carbon fiber, Kevlar: Kayaks made from composite materials have a better appearance, more durable and much lighter than Kayaks made from plastic but it is very expensive. At the end of the day, to choose a right Kayak needs more than just 6 above criterions. But I hope after taking a look at these criterions will give you first thought about choosing your fishing Kayak. After reading 6 criterions I bet you have somewhat imagined how your favorite Kayak would look like among thousands of model out there in the market. The length, the width, which type…. Now, let’s me help you to curtail the range even more by analyzing the pros and cons of 3 following best ocean fishing Kayaks. I am lucky enough to have the chance to experience these Kayaks, only in short terms but they immediately climb up on top of my wish list. Now, why don’t you take a look these amazing ocean fishing Kayaks? Vibe Kayaks Skipjack 90 weighs 46 pounds, 9 feet in length, 32 inches in width, with weight capacity around 300 pounds and 2 sealed hatches. The first impression with this Kayak is that it is very lightweight, much lighter than Perception R15 Pescadores 10.0, a model that I have experienced and really like, weighs 54 pounds. You won’t have to worry about handling or carrying this Kayak, it’s easier than ever no matter what your level of skill is. This is good news if you are an angler who has to travel a lot. With 9 foot long and 32 inches wide makes this boat become one of the most stable, maneuverable Kayaks in range. It is easy to be turned and it is going to move smoothly and stable above the waves and under the winds of any heavy fishing seas such as Martha’s Vineyard Sea in Massachusetts or Florida Keys Ocean in Florida… However, only 9 feet in length, it is clear that you should get rid of the intention to win any race with this boat because of its modest speed. It’s more suitable if you are an angler who just wants to relax on the ocean or to fish some easy ocean fish. If you are already a pro angler and your desire is to catch big and fast fish in the ocean, I suggest you Kayaks with the length over 11 feet to take advantage of their great speed. If you are an angler has a habit to bring all your gears along with then Vibe Kayaks Skipjack 90 is the right one for you. 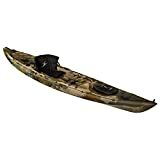 Vibe Kayaks Skipjack 120T weighs 72 pounds, 35 inches in width, 12.2 feet in length, and weight capacity is around 500 pounds and 2 sealed hatches. This Kayak reminds me about one of the most successful tandem Kayaks models in the market that I had tried before, eMotion Spitfire Tandem Sit-On-Top Kayak 12′ with the same length, same width, only a difference in the weight. Vibe Skipjack 120T weighs 72 pounds, 6 pounds heavier than eMotion Spitfire 12’. It doesn’t matter that you are a beginner or a pro angler; you will have to struggle to handle or carry this boat by yourself, so I advise you to have a friend to handle it with your friend to share the heaviness. Furthermore, 12.2 feet in length and 35 inches in width is a very clever design of this boat. The width provides anglers with amazing stability, so you can still balance this boat even if you are a beginner who has no such skill at all. Among all features, the length is my favorite feature of this Kayak, which is 1.5 times as long as Vibe Skipjack 90. It is significantly faster but less maneuverable. But with 2 anglers on board, it becomes slower so I don’t suggest you trying to fish too fast ocean fish with this Kayak even if you are already a pro. Besides, the storage capacity of this Kayak is the same to Vibe Skipjack 90 with 2 sealed hatches and a wide-open deck for essential goods and some small electricity to enjoy an ocean fishing trip without finding yourself in short of anything. BKC UH-TK219 weighs of 70 pounds, 12.5 feet in length, 34 inches in width and maximum capacity of 440 pounds and multiple storage areas. The thing I love the most about this model is that it weighs only 70 pounds compared to Vibe Skipjack 120T with the weight of 72 pounds. You may think 2 pounds lighter may be nothing. In fact, it makes a big difference for anglers who usually have to move from beaches to beaches. This weight allows this tandem model can be handled by a single angler. If you are an angler who most of the time wants to go fishing with the company but occasionally want to go fishing in the ocean alone then this Kayak is perfect for you. BKC UH-TK219 seems to exchange the stability for the speed. It owns the impressive length 12.5 feet but 34 inches in width. It is 0.3 feet longer than Vibe Skipjack 120T but 0.1 inches less wide. This Kayak’s great design allows you to move on the ocean fast like a wind but less stable. Even with 2 anglers on board, this Kayak still provides you with amazing speed. So, if you are a pro angler, don’t be afraid to challenge yourself with bigger and faster ocean fish yet if you are an amateur, try not to put yourself in danger with those stubborn fish before you have some skill to keep your boat balance. The second thing I like about this Kayak is the arrangement of the storage areas of this boat. It is about the convenience. The hatches are set up right under your legs for that reason it is very easy for you to reach whatever you need when you don’t have the chance to put down your rod. However, what I don’t like the most about this Kayak is its weight capacity which is only 440 pounds. It is only capable of carrying 2 fit or a little bit over average anglers. If you are too big, it won’t be safe for you to go ocean fishing with BKC UH-TK219. 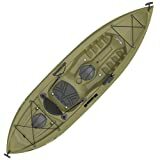 Lifetime Tamarack Angler Sit-On-Top Kayak, Olive, 120"
My very first impression about this Sit-on-top fishing kayak is that it’s not too heavy or too light if compared to the Lifetime 10-foot, this kayak is clearly lighter. This is significant because its weight and length o makes it convenient to be transported and loaded by myself, which I really recommend for beginners. This kayak has a length of 10ft and a width of 32in and V-shape hull, which offers an impressive performance and helps you balance through the water with the stability to move in currents and winds. This kayak is suitable for many bodies of water like lake, river or ocean. However, I have to say that its size might not meet a need of a tournament, it can be suitable for anglers who just want to fish for fun. If you want to go professional, you should look for an 11-13 feet long kayak which I believe is the most suitable size for catching bigger fish. For a 10ft kayak, storage option is what I have to sacrifice for. It has two hatches with shock cords. This should be the place for me to put my crate of gears and a pack of accessories and lures. However, I usually go out for a whole day’s fishing. So, the storage seems not enough for me because I can’t bring more like a crate of food or a bucket to store fish. Besides, its capacity is about 124 pounds. This is quite modest to load some heavy stuff like an accumulator or those who are heavy! The seat should be the very first option I want to upgrade. Its bottom seat is okay, but its back seat is basically useless. However, it is a cheap fishing kayak, so the lack of comfort can be understood. And, I highly recommend you upgrade the seat option with a new one that at least has more cushion. 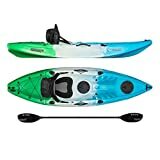 Overall, I would say the Lifetime Tamarack Angler 100 is a good deal for those who are looking for a fishing kayak to experience and entertain. This is one of the most popular kayaks designed for fishing. It is 13,4 feet long and 28-inch wide, which seems to make the kayak long and narrow. It means this kayak is suitable for both calm and rough water and it offers a great performance in speed and stability. With a length of 13,4 feet and a width of 28 inches, its storage is more than enough. It has rear oversized tank well, large front hatch, 2-rod holders, … This is too generous for me to bring crates, gears, tackle boxes and personal cooler. Its storage option makes it so worthy a fishing kayak. Thus, I highly recommend those who want a professional fishing kayak for a real big fish catch. However, its long hull can be inconvenient. You must mind your garage with its length. And, you can’t just transport it with your pick-up truck, meaning you should have an extra spend on a kayak rack. Therefore, I underrate its versatility. Anyway, it is just 56 pounds and it’s still much lighter to lift by if compared with the other 13-feet kayak like Vibe Kayaks Yellowfin 130T that is 80 pounds. I expected the seat should be more comfortable. The seat is standard and okay, but it’s not really comfortable for long. If you think about going out for a long day with this kayak, you will want to upgrade the seat to make sure you won’t get sore for the next day. 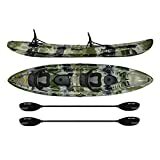 In conclusion, this is a perfect fishing kayak for avid fisherman looking for a kayak combining performance with features. And so I have finished reviewing my top 3 best ocean fishing Kayaks. I hope my review would help you out. Good luck with finding your most suitable ocean fishing Kayaks.